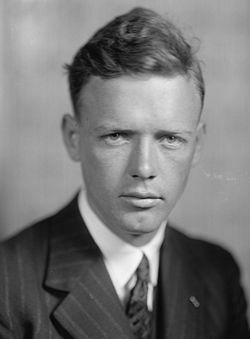 In 1923, before Charles Lindbergh became famous, like all barnstormers of his day, he wanted to boast that he had flown in Texas. When he bought his first World War I surplus Jenny in Georgia, he flew it to Texarkana. The following year, on a trip to California, Lindbergh mistook the Nueces River for the Rio Grande and by the time he discovered his error he had to land in a sheep pasture outside Camp Wood, Texas, about ninety-miles west of San Antonio. The pasture proved too small for a takeoff with both Lindbergh and his partner Leon Klink in the cockpit. “Slim,” as Camp Wood residents called Lindbergh, flew the plane into town and landed on the town square. The takeoff required fitting the forty-four-foot wingspan of the Canuck (Canadian version of the Jenny) between telephone poles spread only forty-eight feet apart. All went well until one wheel dropped into a rut in the street causing the plane to swing around, strike a pole, and crash into a hardware store. No one was injured and the storekeeper refused payment for damages. After a week of hosting the young aviators while they repaired their plane, the town took a real liking to the pair, especially the quiet and courteous Lindbergh. Two weeks after his Camp Wood experience, Lindbergh became a U.S. Air Service Cadet at Brooks Field in San Antonio, completing his advanced flight training at nearby Kelly Field in 1925. 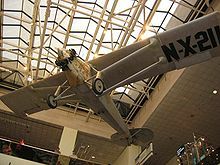 Lindbergh became a world-famous aviation hero by making the first solo flight, May 20-21, 1927, aboard his Spirit of St. Louis from Roosevelt Field in Garden City, New York, to Le Bourget Field in Paris. National Air & Space Museum, Wash. D.C. I am fascinated by all things Lindbergh. Thank you for sharing his Texas adventures.